It’s countdown time to Christmas. Christmas is my favorite time of the year. It happens to be around my birthday, which can be a big bummer some years since everyone’s forget. But who cannot resist the decoration! And the food! And the cookies! If you’re celebrating Christmas on the 24th and opening gifts, you don’t have a lot of time! Suckers. In the interim, I spent a few fab days with Morgan of Your Living City making epic cute Christmas gifts. They’re easy, they’re cute and they are homemade. You cannot throw away homemade gifts; like Grandma’s sweater. Teacups – Perfect time to use the old, mismatched sets. Wicks – found at any craft store. Chop the wax into small pieces (1 cm is fine), this is especially important if you want use a blockljus or remaining wax from used candles. I used a very sharp knife to shave all the candles down and place in a small pot. In a larger pot, fill 1/3 way up with water. Turn the stove on to medium high to bring the water to a low boil. Put the small pot in the larger pot and ensure the water level is no more than halfway up on the small pot. You do not want to get water in the wax. This can take anywhere from 10-30 minutes to melt all the wax depending on how big your pot is. 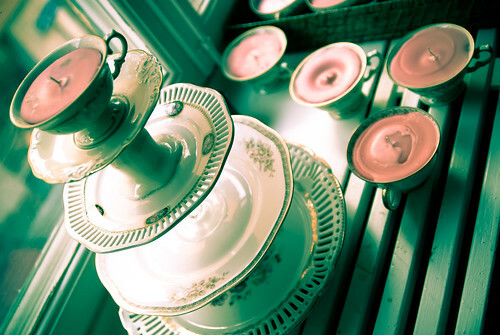 While the wax is melting, set each teacup with a wick. The bought wicks are great because they have a metal bottom and will hold weight. After the wax has melted, pour the hot wax into each teacup, no more than halfway up. After the wax cools, you will have to add more wax since it sinks and contracts. Be careful when melting wax. Do not microwave wax and always use a double boiler when melting it on the stove. A double prevents fire and allows for even heating of the smaller container. Check out Your Living City’s article for more details. A cake tier stand is another wonderful gift that’s not only homemade but also environmentally friendly. Made from old plates and glasses, you can make a stand that’s as many tiers as you want and in any style: glass, porcelain or even silver. Wash and dry all the plates and glasses. Glue two at a time. That means, glue one plate to one glass and let rest for a 3-4 hours. When that’s done, you can glue those sets together. See Your Living City’s post for the full story. Run by yours truly, give the gift that keeps on giving. Send your friend, mom, dad, brother, cousin, husband, sambo, wife, dogsitter, secretary, coworker to three nights of Indian food. You’ll cook, you’ll fall in love and you’ll stuff yourself. Standard class is three nights with 7-9 dishes to learn. Includes a recipe book with 25 recipes. They’re from my mom so you know they’re awesome and delicious. Custom classes can be organized at a common center or friend’s house, or can be a different number of nights with your favorite Indian dishes. Contact me for details and pricing. I’ll be checking my mail regularly until the 25th so it’s still time to give something cool to someone you love and love to get a meal from.